From 2012 to 2015, Stillness of Heart will share interesting excerpts from the extraordinary diary of Kate Stone, the daughter of Louisiana cotton plantation owners who chronicled her turbulent life throughout the Civil War era. 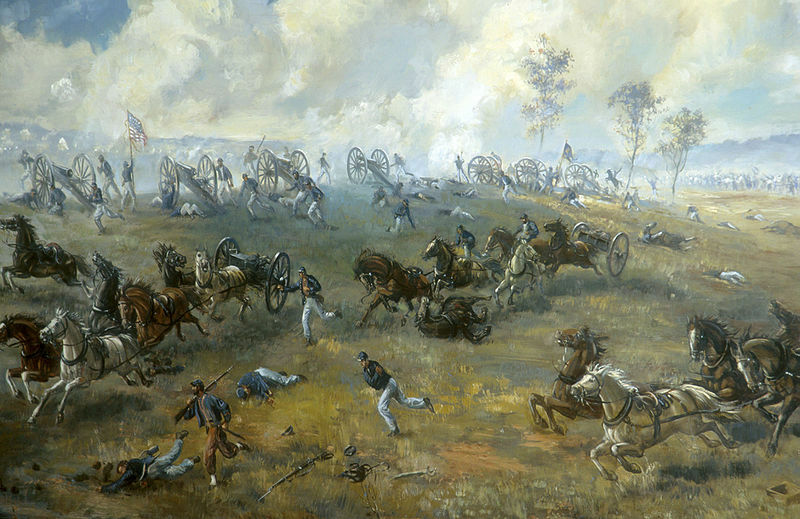 In late July, Stone’s diary recorded news of the first major battle between Union and Confederate forces in Virginia, the Battle of Bull Run, or the Battle of Manassas, fought on July 21, 1861. The word “First” often accompanies historical mention of this battle because a second battle would be fought on or near the same ground 13 months later. Received telegraphic accounts of our first pitched battle fought at Manassas Junction. Our side victorious, of course. A reported loss of 3,000 for us and 7,000 for the Yankees. The losses we hope are exaggerated. Reported that Gen. [Winfield] Scott and [Jefferson] Davis were in command. If Gen. Scott is defeated, it will make our victory more complete. My Brother and Uncle Bo may have been in the fight, but we hardly think so as on the thirteenth they were still in Richmond. Stone received wrong information on who was in field command. Irvin McDowell commanded Union forces, and Joseph E. Johnston and P.G.T Beauregard commanded the Confederates. Winfield Scott was general-in-chief of all Union forces, and he had remained in Washington. Confederate President Jefferson Davis visited the battlefield near the end of the fighting. The battlefield maps and accounts of combat are always tragically fascinating, but Stone’s diary instilled in me a genuine sensitivity and respect for the real cost of these engagements. Families shattered. Love lost. Fears deepened. Tightly-held hopes slowly suffocating. Manassas was only the beginning. Mamma and Mr. Newton rode to Omega yesterday morning and learned some of the details of the Manassas battle. It was gallantly fought and won. Poor Col. Bartow fell, banner in hand, rushing on so bravely. Mr. Newton heard his brother George was in the fight but came through unharmed. Tomorrow is a day of thanksgiving for victory. Mr. Newton leaves us for his home early Monday. He is busy tonight packing. How much we will all miss him.